"Is sexuality a component of consciousness?" Ex Machina is an emotionally complex and deeply psychological drama about artificial intelligence, the nature of self-awareness, and preservation. British novelist turned screenwriter Alex Garland makes a narratively ambitious directorial debut from his own original, ponderous script for this bare bares, stripped down story about men and the motives around their creations. The cerebral film is full of provocative, hypnotic imagery and thoughtfully imaginative yet timely ideas. What is so remarkably fresh and insightful about Garland is his ability to liven up and take familiar material—like zombies in 28 Days Later, space travel in Sunshine, and a dystopian future in Dredd—and inject it with a new spin and wry sense of wonder for a wholly unique, original entry into its own genre of filmmaking. He does much of the same here taking a predictable sci-fi premise and treating it with an assured, masterful hand. The small cast is used for every inch of their talent but in the subtlest of ways. Whether it's Oscar Isaac as an reclusive tech magnate and inventor with a strong "bro" sensibility to Domhnall Gleeson's blank cypher of a programmer role tasked to test the new A.I. 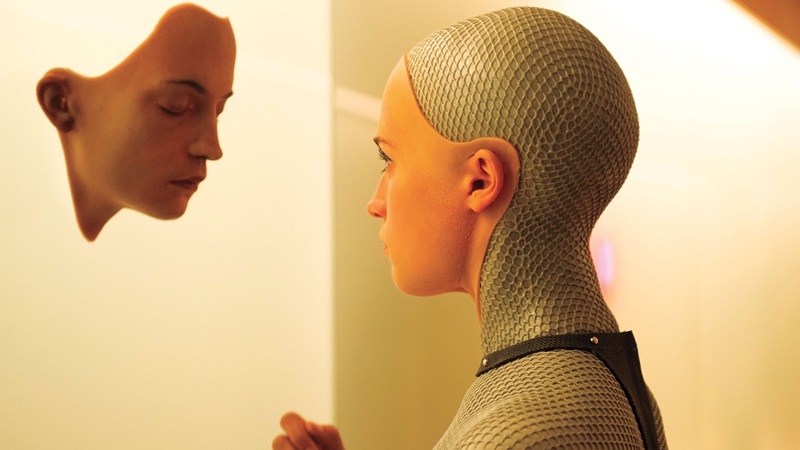 in the form of Swedish actress/dancer Alicia Vikander in a sensational performance as Ava, a self-aware robot, full of her own mysteries, every bit of acting builds on the film's increasing sense of dramatic claustrophobia and isolation. Vikander is undeniably the heart of the film as the triangle nature of the trio's relationships grows and evolves to a thrilling boiling point where their competing motivations come to reveal themselves rather thrillingly. There's nary a false note despite the intellectual and philosophical complexity of the film's scientific subject matter. Garland executes every moody scene of captivating dialogue with dry wit and sophisticated verve. Ex Machina is so confidently and economically made as it heightens all its hefty ideas with a pervasive tension. This is only more impressive by having essentially just three real characters set in a closed environment. It makes you think and will mess you up.